I’ve decided to make a tooth for Boo to hold so that she could be some sort of vampire tooth fairy. 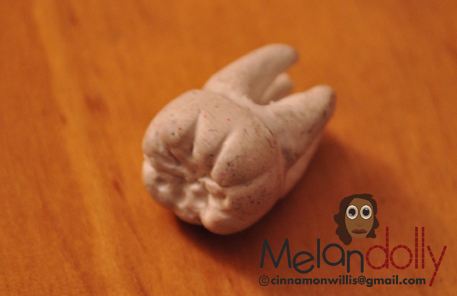 I made this one out of polymer clay because of the firmness which makes it easier for me to shape. I’ve been working with paperclay for my dolls because of how rough polymer clay is on my hands but I think it’s too soft for this job. I figured I go back to polymer for this small addition. My other gripe I have with it is that I can’t seem to keep this stuff clean. I manage to get every little speckle of dirt on it that I can. Anyone have a way to get around this? I’m going to paint over it anyway but I’m sure someone has the secret.